With a background like this, it was inevitable that Dana would get involved in music. Dana played his first paying gigs with his Dad while he was in high school, and caught the eye of area professional musicians in the process. Although Dana earned his Music Education degree in 1964, he soon determined that performance was more to his liking rather than teaching. Following a stint in graduate school in Buffalo, Dana joined musician’s Local 92 there and earned his position on the “first-call” list of players. Subsequently, he worked with Mel Tormé, Johnny Mathis, Henry Mancini, The Four Tops, The Temptations, Bobby Rydell, Frankie Avalon, Floyd Cramer, Boots Randolph, Brenda Lee, Englebert Humperdinck, Lou Rawls and Nancy Wilson. For years Dana was sax section leader for the Variety Club Telethon in Buffalo, backing up acts such as Della Reese, Robert Guillaume, Peter Marshall, The Lettermen, Julius LaRosa, The Four Aces, The Four Lads, Clint Holmes, Alan Thicke and other stars that appeared on the show. He was lead reed player with the Ice Capades; and, was also first-call pit musician for Broadway road shows that came to Buffalo during that time, playing 42nd Street; Singing In The Rain; Annie; Roberta; The Me Nobody Knows; A Chorus Line; Peter Pan (with Bonnie Franklin); Stop The World, I Want To Get Off (with Anthony Newley); My One And Only; Joseph and The Amazing Technicolor Dreamcoat, and other shows that he can no longer remember — or (more likely) has deliberately forgotten. In the classical music arena, Dana was principal clarinetist in two orchestras, appearing as soloist in Mozart’s Clarinet Concerto with one of them. He was a popular colleague in chamber music performances, especially with soprano vocalists who loved to collaborate with him on Schubert’s “The Shepherd on the Rock”. He also spent a few years as Music Director and conductor for a Western New York opera company, leading the company in performances of The Mikado, Cosi fan tutte, and Hansel and Gretel. Dana finally yielded to the teaching side of his talents, working with advanced clarinet students; one of his more promising protegés, Carmelo Galante, became principal clarinetist with the Omaha (Nebraska) Symphony Orchestra and is still in that position. St. Paul-based Skylark Opera (formerly North Star Opera) (http://skylarkopera.org). 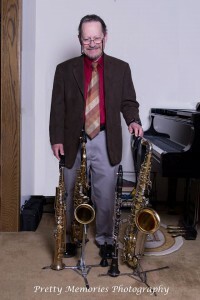 He can also be seen and heard playing his sax (and has composer credits) in an indie movie, The Spirits of St. Paul, (http://www.youtube.com/watch?v=ZfsX3_oyUA4) which depicts the colorful history of St. Paul’s gangster era. For a number of years Dana handled the sax section lead chores for the Good News Big Band (http://gnbb.org/), a Christian-oriented big band that frequently plays for services at local churches, and also plays concerts at local venues (Staring Lake Jazz Festival, Centennial Lakes, etc.). In and around his musical world’s career, Dana had a thirty-plus year career as a computer programmer / systems analyst and is now retired from that field but still does “tech support” for home computers and networks. Dana is a Lifetime member of the American Federation of Musicians, Buffalo, NY Local 92. Martha Mathewson was the first of six children born to an ordained minister and his wife in the Dunkirk-Fredonia area in Western New York State. Her Mom – while practicing the violin — perched Martha (age three) on several pillows on the piano bench in order to observe and absorb; thus, goes the story, Martha’s musical journey began in earnest at that point. Martha absolutely loved hearing the gospel vocal quartets that visited the family church, especially as she tried to imitate the groups’ old-time gospel piano players. She began playing for church services at 11 years of age! By that time, she was already enrolled in the Preparatory Department at Eastman School of Music in Rochester, NY, studying piano, theory and music history until high school graduation. At age 12, Martha became a bona fide professional musician, not only having been hired by the local V.A. Hospital to play for their Sunday Chapel services, but also establishing a small studio where she taught several of her schoolmates. In the summer between high school and college, she toured with a gospel vocal quartet, acting as their pianist and arranger, performing in more than 50 churches. After college (SUNY, Fredonia), Martha taught public school vocal music and music theory for a dozen years in the Western New York area; conducted large choirs and small vocal ensembles; produced and directed musical theater works; and, prepared vocalists for auditions and performances. She was music director for two music theater companies during their summer productions. 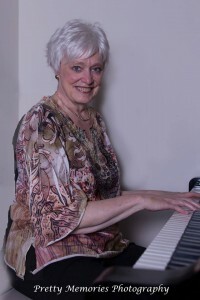 Martha gained a reputation as a first-call accompanist for musicians at all levels, accompanied choral ensembles and was rehearsal pianist for professional Broadway shows at ARTPARK (http://www.artpark.net/), in Lewiston, NY, as well as for four collegiate operatic productions. In 1994, Dana and Martha made a decision to leave New York in order to create more business and music opportunities and chose to relocate to the Twin Cities area. Martha became pianist of choice for several area church music directors, playing for services and choir rehearsals as well as performing in special concerts and benefits associated with those churches. Recently she accepted the position of full-time accompanist-pianist at Our Lady of Peace Catholic Church in Minneapolis. On the secular side, Martha has performed as a cocktail pianist and noteworthy cabaret artist; as accompanist for composer forums and auditions; as pianist for big bands and choral ensembles. Martha also mentors area cabaret and jazz singers, helping to shape their “stylizings” and performance arrangements. She has played as pit pianist and rehearsal conductor for dozens of shows both amateur and professional, and has been featured on several commercial recordings and during live concert events for local artists. For some time now she’s been the accompanist for the Bloomingtones, a senior citizens chorus based (where else?) in Bloomington, MN. They’re a delightful group to work with, and Dana comes along to turn her pages; the two of them play two or three numbers interspersed during concerts to give the singers a break and some added entertainment. And for a number of years she has been the rehearsal accompanist and pit pianist for the student musicals at Wayzata High School in Plymouth, MN.